How did you hear about the East Leicestershire LEADER Programme? What is the East Leicestershire LEADER programme? A Local Action Group is made up of people from the local community and the local public and private sector. This group will decide which projects will be funded in the area. For a list of the Local Action Group members for East Leicestershire visit the Meet the LEADER Team page. How do I know if I am in an eligible area? 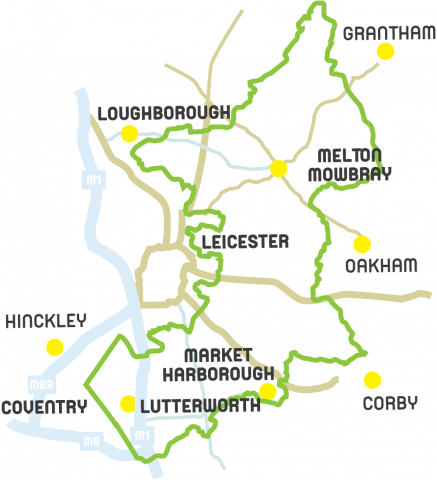 The East Leicestershire LEADER area incorporates a large rural area to the East of the city of Leicester. The whole of Melton and Harborough districts are within the eligible area as well as parts of Charnwood and Blaby districts. This includes the market towns of Melton Mowbray, Market Harborough and Lutterworth. Our handy post-code checker can tell you if your project is within the eligible East Leicestershire LEADER geography. Enter the postcode of your project to find out if it is in an eligible location for East Leicestershire LEADER. All projects must support one or more of the LEADER priorities. Grants of between £7,500 and £75,000 are available (subject to other funding programmes). In most cases grants can provide up to 40% of the total project cost. There are two stages to the application process – an Expression of Interest and a Full Application. In order to apply, you must be registered with the Rural Payments Agency and have an SBI (Single business identifier) number. You can register via the RPA website. For more information please contact the East Leicestershire LEADER Team on 0116 3056298 or email: eastleicestershireleader@leics.gov.uk. We developed a Local Development Strategy, which served as our bid for the funding. This document gives an overview of the East Leicestershire economy, the Local Action Group and the strategy for delivering LEADER in East Leicestershire. Leicestershire County Council has commissioned consultants Hotel Solutions to assess the potential for tourist accommodation development in the East Leicestershire LEADER Area. The study provides a clear picture of the future potential development for tourist accommodation in the area and the role that the County Council and its partners can play in realising this potential.